come from Hungary. Uses include: goulashes, and to add color and flavor to many bland, savory dishes. From the Greek kapto, “I bite”, capsicum is a biting plant. The best comes from Africa, Asia, and South America. It is produced in good quality in the Southern States, especially those that lie beyond the southern line of Tennessee. Grow in West Indies, Hungary, East Indies, Central America. 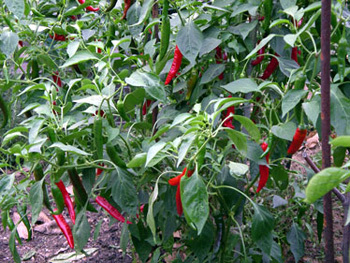 The hot red cayenne chili arrived in the West from India in 1548 and was known as Ginnie pepper. Gerard describes it as “extreme hot and dry, even in the fourth degree,” and he recommended it for a skin infection commonly known then as the King’s Evil. Cayenne was popular with the 19th century physiomedicalists who used its warming properties for chills, rheumatism, and depression. The 1987 study published in the Journal of Bioscience states that rats fed a diet high in cayenne experienced a significant reduction in blood triglycerides and low-density lipoproteins (LDL), or “bad” cholesterol. Capsaicin, a compound found in cayenne that gives the spice its “kick”, is an anti-inflammatory. on a daily basis. Prepared teas are available, or make it from dried herb.